The first public meeting of the Urban Ag Visioning Group for Boston met Wednesday January 21, 2015 at The Boston Foundation with an audience of ~90 participants. Background for the visioning process (see About) was presented along with the objectives and anticipated deliverables. Attendees were introduced to Steering Committee members and asked to share their expectations, questions, concerns, and offers of continued engagement. This information has been aggregated and is available for all to review by clicking on the link below. For the February meeting of the Urban Ag Visioning process, we took a slightly different approach to format. First, the Steering Committee met separately in order to have some focused discussion on the scope of work at hand. Then Steering Committee members joined the general public for some networking, learning, and further conversation. This meeting was generously hosted by the Seaport Hotel & World Trade Center and was an opportunity to focus on apiculture as part of the city’s urban ag vision. Noah Wilson-Rich, Founder of Best Bees shared some history of bees in the city, information about different types of bees, current populations in Boston, and numerous resources. Edwin Medrano, The Seaport’s Chief Beekeeper, described his institution’s adoption and management of hives over the past several years, which has resulted in many positive impacts, including public education and engagement. Their tag team presentation generated many questions, inspired reflection on prejudice, and created an opportunity for committee members to dispel some myths of the current urban ag policy. Time was then allocated to public updates on the Steering Committee’s progress and for questions regarding the visioning process. What is measured currently? How? By whom? What might be very challenging to measure, but is none-the-less critical to track? How might annual information collection/data management happen? Which organizations / partners might assist? The list of draft indicators is provided here for those who wish to review it and to provide comment. Participants gathered on a warm, sunny spring day in East Boston for the fourth monthly meeting of the Urban Ag Visioning process. The view from the meeting room at the East Branch of the public library was spectacular – an extensive, revitalized green space featuring a shared community garden and recreational area robustly utilized by diverse neighborhood residents. During the meeting, those gathered reviewed and discussed the results of the metrics exercise in March and results of the first stakeholder engagement survey. Details of each are included in the meeting slides posted below. In the remaining four meetings, we will delve deeper into best practices, address unresolved barriers to growth, integrate the vision with other local, state, and regional food system initiatives, and determine specfic projects to be realized over the next several years. Marking the official half-way point of the Urban Ag Visioning process, interested stakeholders made their way to the wonderful Kroc Center training facility in Dorchester yesterday for the fifth of eight public urban ag meetings. 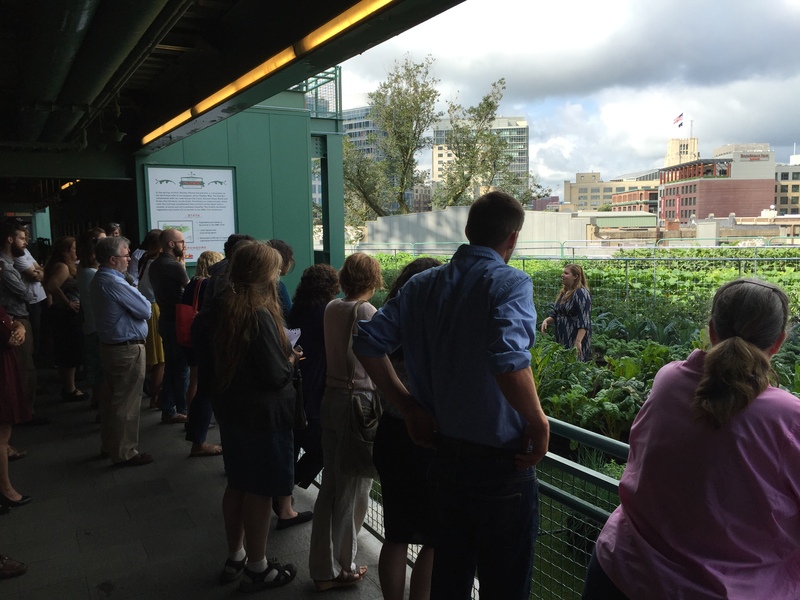 In addition to a review of activities to date, the group discussed how Boston’s urban ag path relates to other local, state, regional, national, AND international initiatives. Participants then had a chance to work in small groups on an urban ag project charrette. Given a near one acre lot of land with a vacant building on it in the city – what approach would you take to develop it into a thriving urban ag site? Insights from the exercise reinforced the challenges urban ag projects face to secure funding, to obtain permits and licenses, to hook up utilities, to clear a site of debris or hazardous materials, to renovate adjacent buildings, and to operate sustainably. Among the concepts generated though were non-profit and commercial operations alike, creative partnerships, diverse financing options, multi-use spaces, and promising outcomes for farmers, residents, and communities. For the last half hour of the meeting, attendees had the option of a mini learning journey of nearby urban ag landmarks. Special thanks to The Food Project and Sutton Kiplinger for assisting with this experiential opportunity. Given the simultaneous process to establish the future structure and priorities of the Boston Food Policy Council, who might represent the interests of urban ag on the council? What urban ag related policies should be prioritized for the next year, two years, three years, etc.? What are some possible solutions to mitigate or to eliminate barriers to growing existing urban ag enterprises or starting new ones? For example, how can the cost for a water hookup be reduced? How can people learn about available urban ag land and potential resources or partners to submit a proposal for its use? What are creative marketing and/or engagement campaign ideas to increase participation and to generate support for urban ag from a larger, more diverse group of Boston citizens? What else do we need to learn to complete this phase of the visioning process? How might the next stakeholder survey be used to target specific groups with outstanding questions? Participants workshopped the above topics in small groups and shared their thoughts, which will be synthesized and posted here shortly. Anyone can still submit thoughts on these either via the comment section or contacting the facilitator (see “contact us” link below). For the last part of the meeting, attendees had the option of a mini visit to nearby urban ag landmarks including community gardens and a food forest. 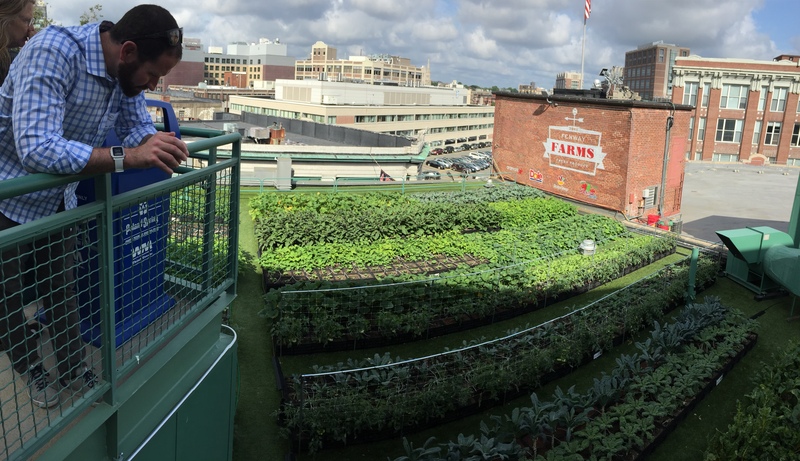 Special thanks to Orion Kriegman of Boston Food Forest Coalition for assisting with this experiential opportunity. Finally, if you or anyone you know is interested in farming the small rooftop at Spontaneous Celebrations, please contact us. We were very fortunate to have the opportunity to host July’s meeting at Fenway Park’s Wheels Up Club. There has been significant media attention paid to the new Fenway Farms and Jessie Banhazl of Green City Growers generously presented to the group and then toured everyone through the site. The operation clearly demonstrates how transformative agriculture can be, as the farm has exceeded production predictions and quickly become as much of a highlight of the venue as the ball field itself. Participants also had the chance to preview and to discuss together a set of draft goals, milestones, and metrics for the ultimate visioning report. All stakeholders are invited to provide input on these via this brief survey. The final urban ag visioning meeting will be held next month! Details and RSVP here. The panelists’ comments addressed their diverse experiences acquiring access to land to farm, property tenure, operational costs, staffing models, partnerships, funding, and more. Each left participants with the invitation to remain engaged in the urban ag movement through acts such as volunteering, community organizing, and creating demand for local products with consumer purchasing power. The last part of the meeting was dedicated to a preview of the forthcoming final report on the urban ag visioning process, due out at the end of the month. Readers are invited to review the vision goals in the attached slides. Please note that minor changes may still occur prior to release of the final report. 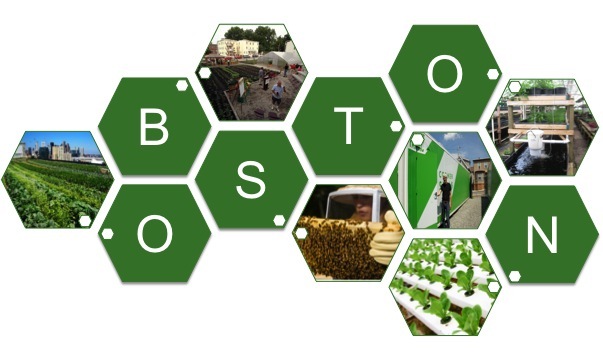 As this process concludes and moves into a phase of implementation, Allison Rogers, Interim Director of the City of Boston’s Office of Food Initiatives (OFI), let attendees know that the OFI will soon be fully staffed, including personnel dedicated to urban ag. The final visioning report will be made public and information made available on the City’s website on how folks can stay involved. A sincere thank you to the visioning Steering Committee, everyone who has attended one of the meetings, all respondents of the stakeholder surveys, anyone who helped to engage others in the visioning process, and of course the thousands of people making urban ag a reality in the city today. The vision would not have been possible without your thoughtful participation and hard work. Stay tuned for the full report!